1Department of Anatomy, Melaka Manipal Medical College, Manipal University, Manipal, India. 2Department of Orthopedics, Faculty of Medicine, AIMST University, Kedah, Malaysia. *Address correspondence and reprints request to: Mohandas Rao, Department of Anatomy, Melaka Manipal Medical College, Manipal University, Manipal, India. Rao M, Ashwini LS, Somayaji SN, Mishra S, Guru A, Rao A. Separate Belly and Tendon of Flexor Digitorum Superficialis to the Fifth Digit. Oman Med J 2011 Jul; 26(6). Variation in the origin of long flexor tendons in the anterior compartment of forearm is common. 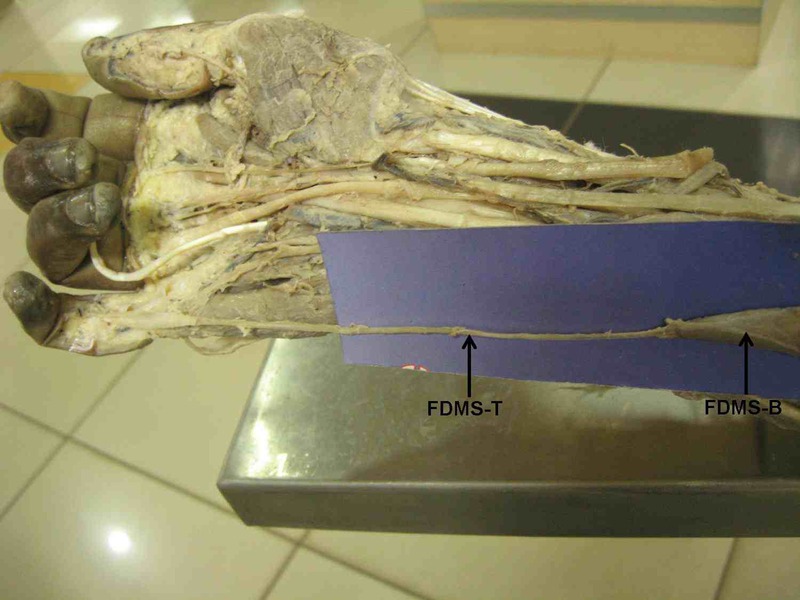 During routine cadaveric dissection at Melaka Manipal Medical College (Manipal Campus), we observed a separate muscle belly and tendon of flexor digitorum superficialis (FDS) to the fifth digit in the right upper limb of a 60 year-old male cadaver. The anomalous muscle belly originated from the common flexor tendon from the medial epicondyle of the humerus and continued as a thin tendon at the middle of the forearm to get inserted into the middle phalanx of the fifth digit. This can be considered as a case of split flexor digitorum superficialis. Such muscle variations and knowledge of their frequency, appearance, and location can be helpful for surgeons. Keywords: Flexor digitorum superficialis; Forearm flexors; Carpal tunnel; Tendon transfer; Digiti minimi. Normally, flexor digitorum superficialis (FDS) arises by humeroulnar and radial heads. Humeroulnar head arises from medial epicondyle of the humerus and medial margin of the coronoid process of ulna. The radial head originates from the anterior oblique line of the radius. Above the wrist, fleshy fibers of this muscle form four tendons for the medial four fingers of the hand. Tendons arranged in pairs in superficial and deep strata, pass beneath the flexor retinaculum within the carpel tunnel to enter the palm. Each digital tendon at the base of the proximal phalanx splits into two slips to allow the passage of tendon of the flexor digitorum profundus and get inserted into the sides of the shaft of middle phalanx of the corresponding digits.1 The muscular abnormality in the flexor compartment of the forearm is less common compared to that of the extensor compartment. We are reporting a rare incidence of separate belly and tendon of FDS of the little finger which may be of clinical/ surgical and functional importance. Figure 1: Dissection of the front of the forearm and palmar aspect of the hand showing a small separate belly (FDMS-B) and a long narrow tendon (FDMS-T) of flexor digitorum superficialis for the little finger. 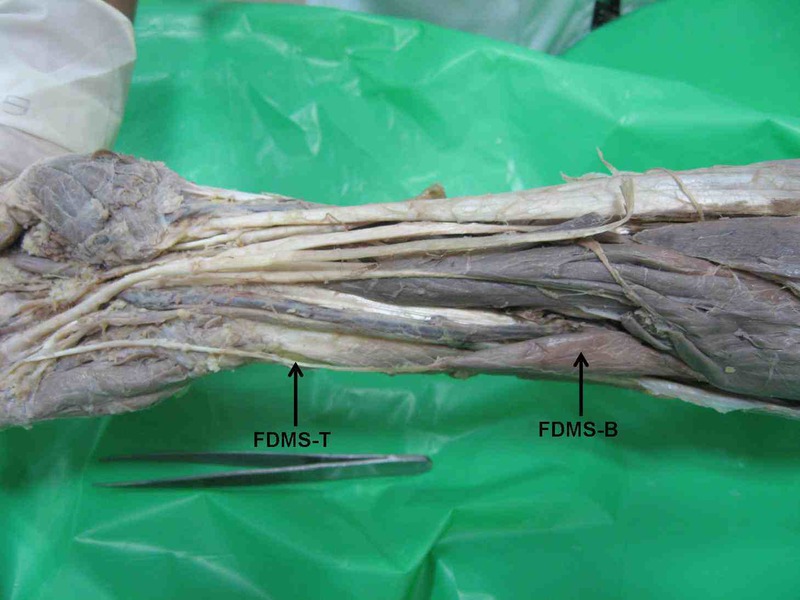 Figure 2: Dissection of the front of the forearm and palmar aspect of the hand showing a small separate belly (FDMS-B) and a long narrow tendon (FDMS-T) of flexor digitorum superficialis for the little finger. The narrow tendon getting inserted to the middle phalanx of the little finger is also seen. The muscular abnormality in the flexor compartment of the forearm is not very common. Though there are some reports of the presence of additional muscles and other muscular variations; in most cases, these abnormalities go unnoticed as they do not produce any symptoms in the individual.2 There are several reported variations of the FDS muscle. Bergman et al. have listed a series of about 24 variations of flexor digitorum superficialis.3 Some of the variations they recorded include: the absence of the tendon for the little finger; suppression of the radial origin; a deep slip of the muscle to the annular ligament; muscle coexisting with the Palmaris longus; a double coronoid origin with an upper fleshy slip and a lower tendinous slip; a connecting muscular band between the origins of the FDS and the tendons for the index and little finger arising from a separate digastric muscle; absence of tendon to the little finger; and double tendons for the middle digit and flexor pollicis longus and a slip from this muscle to the Palmar fascia coexisting with a feeble Palmaris longus. In extremely rare cases, a muscle called radiopalmaris arises from the anterior surface of the radius in common with FDS and gets inserted into the palmar aponeurosis or to the synovial sheath covering the FDS.3 Shoja et al. reported a variant FDS; the deep part of the FDS was found to be split and showed two distinct fusiform muscle bellies. The medial belly originated from the common flexor tendon from the medial epicondyle of the humerus and continued as a thin tendon at the middle of the forearm to insert onto the fifth digit.4 However, in the current report, the muscle belly destined to the second digit was a part of FDS. Senda and Muro reported an abnormality of the flexor digitorum superficialis of the little finger, where fleshy fibers originated from the palmar aspect of the carpal ligament.5 However, in the present case; the tendon of FDS for the little finger had its belly arising from the common flexor origin. In addition, occurrence of independent muscle tendons of flexor digitorum profundus and flexor digitorum superficialis to the middle and index fingers has also been reported.6,7 These earlier reports suggest that the case reported here is unique. Variations when noticed have also been the cause for anxious moments on the operating table for the surgeon. Flexor digitorum superficialis tendons are often used in tendon transfers following injury to the ulnar and radial nerves.10 Abnormality in the course of the tendon may make it difficult for the operating surgeon in the identification of these tendons during such transfers, especially since tiny incisions are used over known anatomical regions for the release and withdrawal of these tendons during such procedures. In the present case, the separate tendon of FDMS traversed along with the other tendons but remained more ulnar than usual in its course in the forearm and the carpal tunnel. This independent and abnormal course of the tendon of the flexor digitorum superficialis to the little finger has not been reported before and becomes important to the clinician and surgeon as it can confuse a surgeon when operating on the forearm and wrist for injuries of the tendons. Abnormal muscle presentations can present with altered anatomy of known structures in the region. In this case, the abnormal presentation of the flexor digitorum superficialis to the little finger with a separate muscle belly from its origin at the common flexor origin, its location away from the other tendons of the FDS, and its relationship to the median nerve in the forearm and carpal tunnel can perplex the operating surgeon. Generally, the flexor digitorum superficialis is a digastric muscle with a proximal common muscle belly giving rise to tendons to the index ring and little fingers. Since these tendons are not independent, they are considered unsuitable for non-synergistic transfers, such as for finger extension. However, the muscle and tendon to the middle finger arising separately is thought to be more suitable for non-synergistic transfers.12 Whereas most anomalies present with unpleasant symptoms, the abnormality noticed here in the flexor digitorum superficialis as a separate entity from its origin to its insertion may actually make it an advantageous situation for such patients in the event of a need for a tendon transfer. It may hence be true to say that when indicated this abnormality would allow the otherwise non-synergistic component of the flexor digitorum superficialis to be used as a synergistic component in tendon transfers. In addition to the surgical advantages of this independent muscle belly and tendon, there could be some functional advantages of such muscles. According to Tan et al. independent functioning of FDS is very minimum in the little finger when compared to that of the ring, middle and index fingers.13 However, in cases where there is a separate belly and tendon of FDS for the little finger, it could be possible that the independent functioning of that digit is much higher. The variation reported in the present case is unique in its position and relations, thus acknowledgement of such variations could be useful for the clinicians, hand surgeons and plastic surgeons. Authors declare no conflict of interest regarding this manuscript and no financial grant or assistance has been taken from any financing body towards this work. 1. Standring S, Borley NR, Collins P, Crossman AR, Gatzoulis MA, Healy JC, et al. Gray’s Anatomy: The Anatomical Basis of Clinical Practice. 40th Edition, Elsevier, Churchill Liwingstone, London. 2008; 846-847. 2. Rodrigues V, Nayak SB, Rao MK, Vollala V, Somayaji N, Rao AS. Abnormal muscle in the anterior compartment of the forearm: a case report. Cases J 2009;2(2):9125. 3. Bergman RA, Afifi AK, Miyauchi R. Illustrated Encyclopedia of Human Anatomic Variation: Opus I: Muscular System: Alphabetical Listing of Muscles: Flexor DigitorumSuperficialis. http://www.anatomyatlases.org/AnatomicVariants/MuscularSystem/Text/F/17Flexor.shtml (Accessed on January 29, 2011). 4. Shoja MM, Tubbs RS, Loukas M, Shokouhi G. The split flexor digitorum superficialis. Ital J Anat Embryol 2008 Apr-Jun;113(2):103-107. 5. Senda H, Muro H. Subcutaneous rupture of the flexor tendon of the little finger associated with anomalous flexor digitorum superficialis. Hand Surg 2007;12(2):87-90. 6. Nayak SR, Ramanathan L, Prabhu LV, Raju S. Additional flexor muscles of the forearm: case report and clinical significance. Singapore Med J 2007 Aug;48(8):e231-e233. 7. D’Costa S, Jiji, Nayak SR, Sivanadan R, Abhishek. Anomalous muscle belly to the index finger. Ann Anat 2006 Sep;188(5):473-475. 8. Skie M, Ciocanel D. Anomaly of flexor digitorum superficialis penetrating through the median nerve: case report. J Hand Surg Am 2010 Jan;35(1):27-29. 9. Ametewee K, Harris A, Samuel M. Acute carpal tunnel syndrome produced by anomalous flexor digitorum superficialis indicis muscle. J Hand Surg Br 1985 Feb;10(1):83-84. 10. Brandsma JW, Ottenhoff-De Jonge MW. Flexor digitorum superficialis tendon transfer for intrinsic replacement. Long-term results and the effect on donor fingers. J Hand Surg Br 1992 Dec;17(6):625-628. 11. Figueiredo UM, Hooper G. Abnormal course of the median nerve associated with an anomalous belly of flexor digitorum superficialis. Hand 1980 Oct;12(3):273-274. 12. Agee J, McCarroll HR, Hollister A. The anatomy of the flexor digitorum superficialis relevant to tendon transfers. J Hand Surg Br 1991 Feb;16(1):68-69. 13. Tan JS, Oh L, Louis DS. Variations of the flexor digitorum superficialis as determined by an expanded clinical examination. J Hand Surg Am 2009 May-Jun;34(5):900-906.